IMF lending increased to unprecedented levels in the aftermath of the global financial crisis. As difficulties emerged, we extended financial support to countries across the world—in the euro area, Africa, Asia, the Middle East, and emerging economies in Europe. The IMF tried to draw lessons in real time as the crisis evolved in order to adapt our operations. We reviewed individual programs and, from time to time, paused and took stock of our experience across countries. The latest such cross-country review was our December 2015 review of crisis programs . 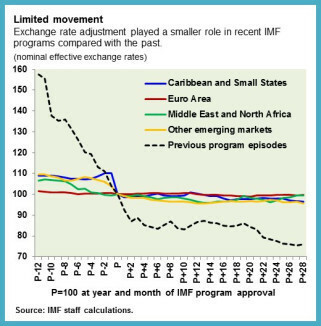 The review looks at the IMF’s experience with 32 programs approved during the five or so years after the crisis in 2008. The crisis was difficult and exacted a tremendous toll on countries, which had to deal with consequences amid quickly changing and often unprecedented circumstances. The world economy was extremely fragile and financial markets unsettled. In this environment, policymakers in the euro area had to contend seriously with the possibility that they could have systemic repercussions given the interlinkages between countries and the absence of a firewall and crisis management framework. Two broad conclusions emerged from the review. First, IMF programs played a part in helping the world avoid a fate that many had feared at the outset—a meltdown of the global economic system, a repeat of the Great Depression, a cascading of the crisis from country to country—and, second, the IMF adapted its program design as the crisis unfolded. Lesson 1: If the exchange rate is not available as a tool to help the economy adjust to shocks, we may need to prepare for longer programs with more financing. A notable difference between the crisis program cases and historical program episodes was the very limited adjustment in nominal exchange rates this time. In the chart below, the black dashed line shows the nominal exchange rate path in previous program episodes while the colored lines show the exchange rate path for the various regions in the recent crisis cases. In some cases, the lack of exchange rate movement reflected currency union membership (the euro area); in others it reflected some form of managed exchange rates. In yet others it reflected concerns about the potential impact of a large depreciation on households and corporations that had borrowed heavily in another currency. But regardless of the reason, the main point is that nominal exchange rates did not move much. Instead, the adjustment strategy of many countries relied on so-called “internal devaluation,” which seeks to restore external competitiveness by lowering domestic prices instead of the nominal exchange rate. Internal devaluation proved hard to achieve. Some of the overvaluation of real effective exchange rates was corrected, but on average real effective exchange rates adjusted by only 12 percent across program cases, compared with around 48 percent historically. An old truth re-emerged: adjusting the economy smoothly and quickly is much harder to achieve when the nominal exchange rate is not available to help, such as in currency union members. It requires a large macroeconomic (especially fiscal) adjustment and deep-seated, sustained structural reforms—and even then may take longer to achieve than the typical three to four- year period of an IMF program. Lesson 2: The pace of fiscal adjustment matters, and so does the composition.Fiscal adjustment is necessary to reduce public debt and restore sustainability. It may need to be rapid if financing is constrained or initial imbalances are very high. It is particularly important in these circumstances to build support for and implement complementary measures to support growth. Otherwise, too large a consolidation done too quickly can, by driving down GDP, actually raise the debt-to-GDP ratio by more than envisaged in the short term. Program design in the context of a regional shock that results in several concurrent programs in neighboring economies also needs to take account of the potential spillovers from fiscal adjustment. Other factors also contributed to push up public debt or pull down output, such as bank recapitalization costs, political uncertainty or crises, confidence shocks, incomplete reform implementation, and weak global demand. Despite fiscal adjustment, debt-GDP ratios rose more than expected in Armenia, Bosnia-Herzegovina (2009), Greece (2010), Iceland, Ireland, Latvia, Maldives, Portugal, and Romania. As the larger-than-expected contractionary effect of fiscal consolidation and other factors on output became evident, we advised countries to slow the pace of consolidation (for example, in Armenia, Greece, Hungary, Latvia, Portugal, and Ukraine). Our country teams also paid increasing attention to debt restructuring where the debt was so high as to require an implausibly large fiscal adjustment to bring it down within a reasonable time frame. A concern with debt restructuring, particularly if there are no firewalls, is the risk of contagion. Absent this concern, it is better to restructure substantively and early when necessary. Countries that did so tended to achieve better debt and growth outcomes. Fiscal policy paid special attention to social safety nets and poverty. Several countries explicitly aimed to reduce poverty. Many included some form of social protection in their conditionality. And programs were generally effective in protecting social benefit spending. Lesson 3: Structural reforms are important for competitiveness and growth. This is even more the case when nominal exchange rate adjustment is not available and the strategy is internal devaluation. Structural reforms rightly featured more prominently, therefore, in programs during the crisis period than they had in the previous few years. They were generally implemented well, although implementation was patchier in programs with more numerous reforms or in those that continued for a long time, which might be an indication of “reform fatigue.” And reforms did not always pay off as quickly as expected, as the boost to potential growth seems to have been more modest than expected in the short term. This is no reason to shy away from structural reforms; on the contrary, we should support them all the more because the benefits may not be visible right away. But we learned we should be more realistic about how much of a boost to expect from structural reforms in the short run, as well as the authorities’ capacity to implement these reforms. Lesson 4: To reduce risk, countries need early action to enhance debt resolution frameworks as well as bank supervisory and regulatory capacity. Private balance sheets (household, corporate, and financial debt) were an important part of the crisis, and we tried to ensure that programs took them sufficiently into account. Countries tried to prevent vicious “feedback loops” associated with excessive debt, but they were only partially successful in doing so. The negative effects of bad balance sheets on public finances and growth were bigger than we expected—partly because implementation was patchy, partly because debt resolution/restructuring kept getting delayed, and partly because the crisis kept evolving. At any rate, here too we learned lessons and built them into country programs. Lesson 5: We would benefit from clearer guidelines for future IMF collaboration with regional financing arrangements. The experience with the euro area programs brought to the fore the issue of how the Fund interacts with regional financing arrangements and with members of currency unions. Our interaction with regional arrangements was different than before in some key respects, notably the joint approach to program design, which benefited from the arrangements’ regional expertise and financing. We could draw lessons from the experience with euro area programs to build more concrete guidelines for future collaboration, recognizing, of course, that institutional frameworks and practices differ across arrangements in different parts of the world. Programs with members of a currency union need to deal with the fact that policies set at the union-wide level may importantly influence the economic situation of an individual member. Such policies are often hard to agree as they can require political agreement among all the members. Where changes in union-wide policy were important, we generally sought them through commitments or surveillance advice. The durability of the gains has still to stand the test of time, but the worst outcomes were largely avoided. The decline in output was cushioned and in many cases reversed, imbalances reduced, and financial systems stabilized. The euro area gained time to mobilize political support to build firewalls and a crisis management framework; emerging economies and small states were able to handle the abrupt decline of global trade and financing flows; and confidence in Middle Eastern and North African economies was shored up after the 2011 Arab Spring. Many articles and books have now been written on the global financial crisis and more are to come. For now, what we need to do from a practical perspective is to ensure program design remains agile and focused on members’ needs. Drawing lessons in real time and responding to them is an important part of doing so.